Reischach is a real paradise for those who love winter sports: no matter if skier or snowboarder, bobsleigh rider or cross-country skier – the opportunities are nearly endless. 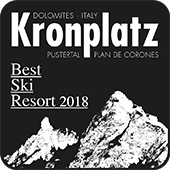 Especially the ski area Kronplatz leaves absolutely nothing to be desired: modern ski lifts, 116 km of slopes for each level and a fun park for freeskiers are at your disposal. Even a ski rent and a deposit are on hand. After an exhausting day on the slopes a lot of après ski bars and mountain huts invite you to have a hot drink. Every day our hotel-own shuttle bus takes you directly to the station and back. You don’t have your own ski or snowboard equipment or maybe just want to try out something new and go sledding? Then our Partner “RENT a SKI”, located at the Valley Station from the SKI AREA KRONPLATZ is just the right place to go! Offering a wide range of skis, snowboards, sledges, helmets and boots, this excellent ski rental aims to meet all your needs. Be our guest and get the opportunity to hire your equipment at the best rates available and a special discount! Another highlight is the nearby sport park, providing a skating rink and a cross-country ski run. For those who love to explore the unspoiled nature off the beaten track, we recommend to take a hike on snowshoes. Another extraordinary event is the Christmas market of Bruneck, taking place from the end of November to the end of January. Typical South Tyrolean dishes and filigree handworks are offered. There you will surely find the right souvenir for your loved ones at home. Enjoy the festive atmosphere and stroll along the nicely decorated stands while the smell of mulled wine and sweet tibits blows through the narrow alleys.